Riverbed Concrete's stained and seal flooring penetrates and permanently stains new or existing concrete, producing unique, permanent color for interior / exterior concrete surfaces. Stained & sealed flooring offers endless design possibilities for residential or commercial applications. What is stain and seal concrete? Stain and seal concrete flooring penetrates and permanently stains new or existing concrete, producing unique, permanent color for interior or exterior concrete surfaces. Riverbed Concrete Inc. offers a wide variety of colorant choices which will add beautiful, translucent color to your commercial or residential concrete flooring. Can you stain and seal my exterior concrete? Yes. 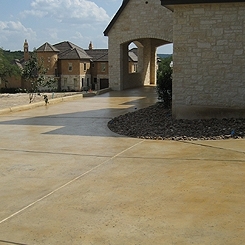 Riverbed Concrete Inc. exterior stained concrete is a great color choice for custom homes or businesses. Exterior stain and seal concrete adds a unique level of character to any home or business that cannot be replicated with any other mediums. What is the necessary maintenance on stained and sealed concrete flooring? 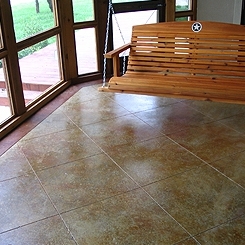 Stained concrete is a low maintenance product, but does need to be cleaned regularly with appropriate cleaners. Please view our Care and Maintenance document for additional information on how to properly care for your stained and sealed concrete flooring. What are the advantages of stained and sealed concrete? 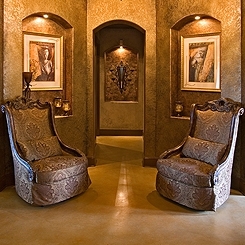 Design Possibilities: Stain and seal concrete flooring offers unlimited design possibilities. Scoring, borders, etching, and stenciling are some examples of design possibilities. Lower initial cost than polished concrete: Stained and sealed concrete flooring offers a lower installation cost than polished concrete. Typically, this is about half the price of polished concrete to install. Are stained and sealed concrete floors slippery? Stained and sealed concrete floors take on the texture that they had prior to staining and sealing. These may continue to be slippery if they were slippery prior to staining and sealing. Often a finish with higher traction (such as a broom finish or salt rock finish) is chosen for exterior stained and sealed concrete flooring.